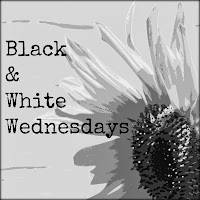 You can link up your black & white photos here! I like the way you framed this shot. The birds are so perfect perched on the tree. I'm inclined to agree even though I'm fairly sure we've pushed the envelope on skipping Spring --- in and out in a week or two with snow on one end, 80 degrees on the other. It better not skip us!! I love the birds in the bush! Great for black and white. I hope you guys survive this next round of cold! Hang in there! The return of birds is always a precursor to spring. Thanks for sharing (and hosting!) :) -- I like the partial silhouette and the play of black and white tones. Just love the little birds in the brambles. I've been experimenting with B & W photos and find them to have more definition sometimes than color - perhaps because there isn't color to distract the eye. what a cool image...i like all the tangled branches even though they are not the star of the picture!! i am not able to identify the birds!! Spring has been teasing us, sending warm days and then suddenly disappearing into winter. Sigh! Those little feathered characters look eager to see some spring world too. I love the birds - such a great shot in black and white!